This year’s Earth Day theme is green cities, a topic that could not relate more directly to today’s post on Phoenix, a city arguably deserving of the title “World’s Least Sustainable City.” A desert vision of unrestrained growth, the history of Phoenix and the surrounding Sunbelt region provides a nationally instructive case study on sustainability. Invited by Future Arts Research, an Arizona State University institute, to “come and do research of [his] choosing in Phoenix” (19), Andrew Ross, Professor of Social and Cultural Analysis at New York University, spent two years in the Valley of the Sun. 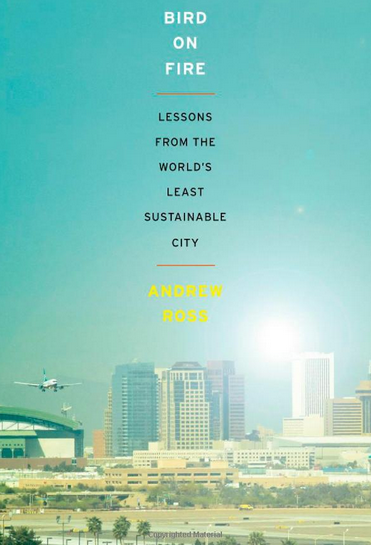 The result of extensive historical research and 200 interviews with the region’s “more thoughtful, influential, and active citizens” (17), Ross’ recent book, Bird on Fire: Lessons from the World’s Least Sustainable City (2011), makes manifest his aim “to take the social and political temperature of Metro Phoenix” (17). From its early days of Anglo settlement to today, the Sunbelt proves a feverish place, whose post-war metropolitan growth tells a uniquely American story. In the Valley of the Sun, an ideology of excess reigns, one which delights in the risk and promise of westward expansion, the spirit of Manifest Destiny, the ideal of the Agrarian Myth, the self-reliance of the frontier mentality, a faith in God’s ability to provide, and a deep-seated desire for limitless growth. While the Sunbelt couples this ideology run amuck with a political culture resistant to the science of climate change, Ross both challenges and empowers the region, saying, “If Phoenix could become sustainable, then it could be done anywhere” (14). Tracing the region’s development, Ross demonstrates how growth in the Sunbelt transpired as if following a blueprint for un-sustainability, dependent in turn and in sum upon “mineral extraction and ranching, irrigation farming, military provisioning, suburbanization, high-tech industry transfers, and absorption of retiree and other migrant populations” (106). In contrast, Ross organizes his text around the topics central to current sustainability efforts: water management, urban growth, downtown revitalization, pollution distribution, the solar power industry, immigration policy, and urban farming. Through chapters dedicated to each theme, he interrogates and rearticulates what sustainability itself means, especially when mapped onto the landscape of the Sunbelt. Broadly, some activists define sustainable growth as that which bequeaths “an equivalent stock of nonrenewable resources to the next generation” (244). On a local level, city officials manipulate sustainability as a desirable public relations instrument. Superseding the cache of the Creative City, Ross argues, “Mayors, especially, have found that green is a useful color to attach to their electoral profiles” (8-9). From the local level to the global, sustainability endeavors often take form as a “bettering of the balance sheet,” which reconciles quantifiable positive and negative metrics, such as weighing increases in the number of solar roofs and transit riders with decreases in water use per capita and golf courses (245). These sorts of sustainable actions depend upon a slew of eco-technological fixes, such as recycling programs, water conservation, LEED-certified buildings, enhanced public transportation run on clean fuels, solar energy, urban farming, and local food systems. Ross argues, however, that the path to sustainability lies not in eco-technological fixes, but in changes in “social relationships, cultural beliefs, and political customs” (16). Otherwise, no matter how innovative a technological solution, it is at nearly certain risk of being inequitably applied over social and geographical landscapes, creating and reinforcing what has been termed “eco-apartheid” (17). While he phrases it as a question, Ross rather definitively concludes that, “The key to sustainability lies in innovating healthy pathways out of poverty for populations at risk, rather than marketing green gizmos to those who already have many options to choose from” (239). In this line of thinking, sustainability is not an effort taken on for the good of the Earth or even for future generations of children and grandchildren. It is an endeavor of the current moment that ought to be invested in for the good of “today’s most vulnerable and affected populations” (250), who inequitably suffer environmental injustices, from poor air quality to toxic exposures. While in the end a hopeful story, Ross demonstrates throughout his text how race, ethnicity, and class profoundly shape ideas about sustainability. He not only maps racial geographies over environmental injustices—revealing the connections between pollution and privilege, toxic exposure and poverty—but also elucidates what Arizona politics reveal about conservatism and conservation on the national stage. Although Arizona politicians present “faux-green reasoning” to support anti-immigration efforts (201)—like the claim that immigrants emit more CO2 in the U.S. than in their home countries—Ross demonstrates how these politics and policies actually reveal the desire of the affluent to retain the power to pollute. Considered the civil rights struggle of the twenty-first century by activists, Ross argues that immigration encapsulates conservative political fears about changing voter demographics. State immigration policy and anti-immigration sentiment in Arizona thus communicate a complex climate-based story, which Ross’ interviewees contend has been simmering since the mid-1980s and has reached a boil recently due to the burgeoning voting block and political potentiality of the “Latino” population (200-201). It is immigration reform not greenwashing that emerges as one key step toward thwarting climate change and promoting sustainability in the Sunbelt. In response to his initial claim that there is hope for us all if Phoenix could become sustainable, Ross concludes, “Time after time, Phoenix turned out to be a textbook illustration of the need to adapt the tenets of environmental justice as the lead principle of green conduct” (246). Phoenix can defeat “the dogma of growth” (53) and its deleterious effects upon the environment, if the actors profiled in Ross’ text—city government, state legislators, university researchers, private citizens, developers, and industry—work together to realign social priorities and profit motives to ensure the wellbeing of the populations most affected by a warming planet. Good morning Ms. Contois, I am very interested in pursuing higher education in food studies. However was just curious as to how you see the future of food studies progressing and what I could achieve with a masters or PhD in gastronomy or food studies. Your career has inspired me and I am striving to attend Boston university upon my undergraduate graduate. Thanks so much for your comment! Food Studies continues to be a burgeoning field within the academy, with many “real world” applications as well. Because of this, there are more and more options for graduate study, which I summarized in this post, though I had a wonderful experience at BU. I’ll send you an email so we can discuss further.